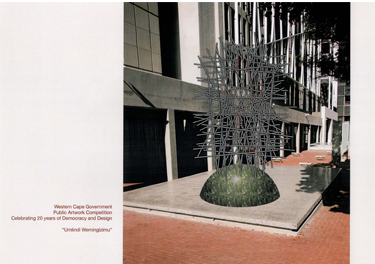 Cape Town has been awarded the title of World Design Capital for 2014. What is the World Design Capital? The World Design Capital is an initiative of the International Council of Societies of Industrial Design (ICSID). The title of World Design Capital is aimed at promoting and celebrating cities that have used design as a tool to reinvent themselves and improve social, cultural and economic life. The title is awarded well ahead of time to allow the winning city to plan and promote a year-long programme of World Design Capital-themed events for the designated year. 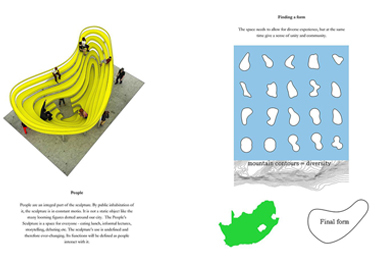 What is Cape Town's Concept for World Design Capital 2014? 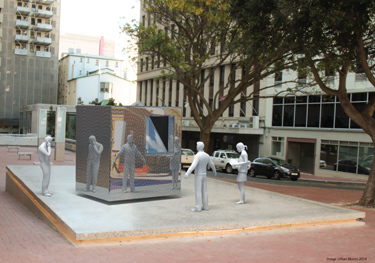 Cape Town's bid concept is "Live Design, Transform Life". The concept places a large focus on socially responsive design. Three broad themes are drawn from this concept namely: Rebuild Cape Town through community cohesion; Reconnect Cape Town through infrastructural enhancement, and Reposition Cape Town for the knowledge economy. Calling all artists! Submit your best piece and showcase it in Cape Town. 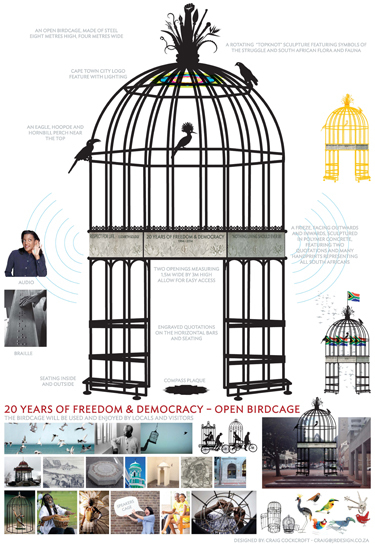 To mark the 20 year anniversary of living in a free and democratic South Africa, the Western Cape Government (WCG) is launching a competition for an exceptional, permanent artwork. Portraits do not qualify and will not be accepted. The piece must highlight the chosen theme of 20 Years of Freedom and Democracy while incorporating the World Design Capital (WDC) 2014 theme of Live Design, Transform Life. 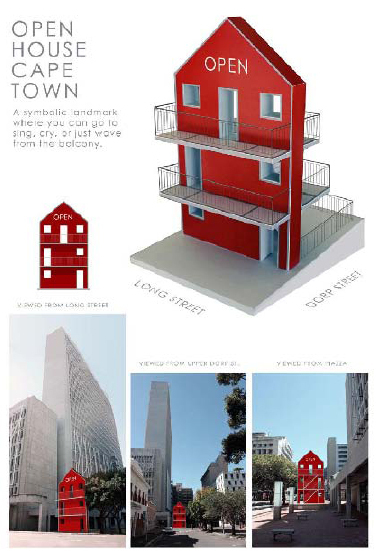 It should depict the extraordinary history and diversity of Cape Town’s community, while still pointing to the city’s aspirations of the future. 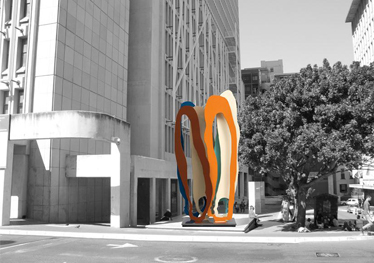 The artwork will be installed on the newly established plaza, corner of Dorp and Long streets, within the WCG precinct. The installation space is 9 639 mm x 6 015 mm and is on a pedestal. The competition is open to all artists. The Department of the Premier will sponsor the competition in an all-inclusive sum up to R1 million. 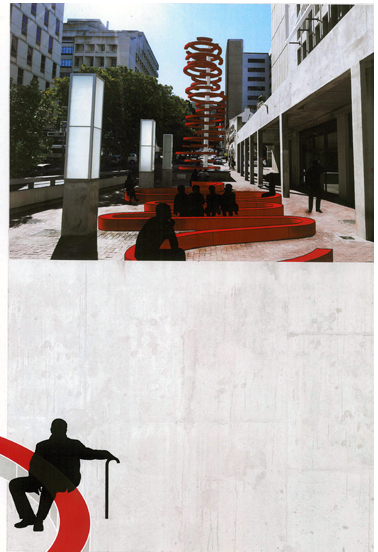 The construction budget will be up to R900 000 to build and install the artwork. The winning artist or team will receive a monetary award of R100 000. Not an artist? You can stil be part of the action. 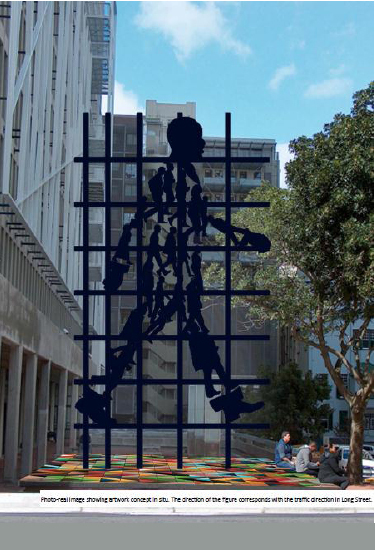 All you have to do is e-mail your comments to westerncape.events@westerncape.gov.za before Thursday 20 November and let us know which finalist you think deserves to have their work on permanent display in the Cape Town CBD. “Contemplation” A sculpture of reflection Nelson Mandela was imprisoned in a small cell on Robben Island for almost 20 years. That’s the same amount of time since the birth of our new democracy. 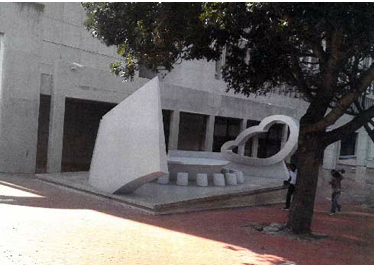 This sculpture replicates the exact dimensions of the internal space in which Madiba was incarcerated for so many years. “Same Same” continues formal and conceptual threads in previous works. Here I have extended generic profiles in a playful depiction of individuality. The heads have become abstracted figures and are now crowded together. There is an implied celebration of this coming together. A festive conjoining. The title hints at these bonds that unite us. As in some previous works there is an intended celebration of youth and potential in this colourful depiction of common bonds and alliances. ‘Table Mountain as a benevolent being’.The sculpture depicts a ‘nest’of steel sticks enclosing a void in the shape of a person, neither female nor male, and not defining any race. 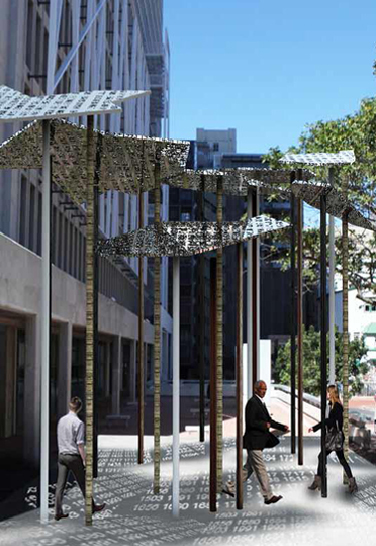 The sculpture is 7.2 metres in height, using 80 steel sticks. The personified mountain is represented by a void. People are an integral part of the sculpture. By public inhabitation of it, the sculpture is in public motion. It is not static. The People’s sculptures is a space for everyone, eating lunch, informal lectures, storytelling, debating etc. the sculptures’ use is undefined and therefore ever-changing. Its functions will be defined as people interact with it. It depicts the contours of our mountains, which is linked to our diversity as a nation. 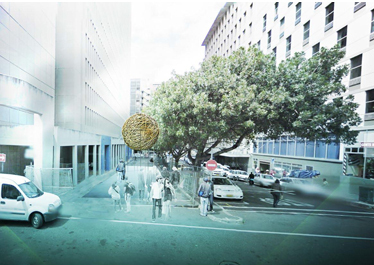 Sokhanyasonke is a light sculpture consisting of a suspended three meter diameter ball made of golden chrome wires entangled with fibre optic at the intersection of Dorp and Long Streets. The more people activate the handles on the pillars simultaneously, the brighter the ball will be, becoming a landmark in the darkness, a light in obscurity. Open House is a multipurpose public space designed to open up possibilities for the usage of it in a public space, be it for artistic performance, a speakers corner and a tree top bench. It also represents ideas. ‘Memories of the past and messages of the future’ hand crafted items developed, rebar bent and welded to desired shape ‘’rusted’’ finish, multiple elements coming together to form a beautiful complex fabric. 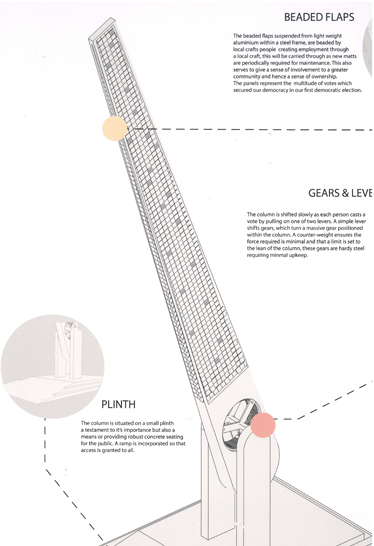 ‘Thingking’ We propose constructing a series of 11 sculptural pendulums. One of the pendulums is constantly swinging, commemorating each moment passed in our nation’s democracy as an achievement in its own right. 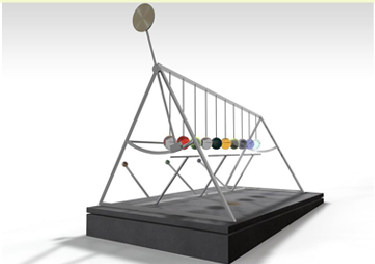 Watching the pendulum swing allows the viewer to gain a sense of the time that has passed – the struggles of the people in that time, the achievements that we have made, and the deep sense of pride that we can share. ‘the people’s column’. This proposal leans left or right as visitors cast a vote by pulling down on a lever. At the end of each day, the tower is illuminated from within, and either red or blue light floods the square based on the angle of the column. This is indicative of the power of the people to affect the environment. Using Maps and Dates to highlight our history:With the theme of 20 years of democracy I designed 20 individual pillars to support the 9 shapes (provinces), raising the landscape above an individual creating a partial shade structure or canopy, ranging in heights from 3,5m - 6m above the ground (larger provinces will use more pillars whereas smaller one will use fewer). At certain times of day the sculpture will create shadows of significant dates on the ground, pillars and individuals standing below the sculpture. The reflective surface will absorb the surrounding content and also place an audience member within the geography and history South Africa. 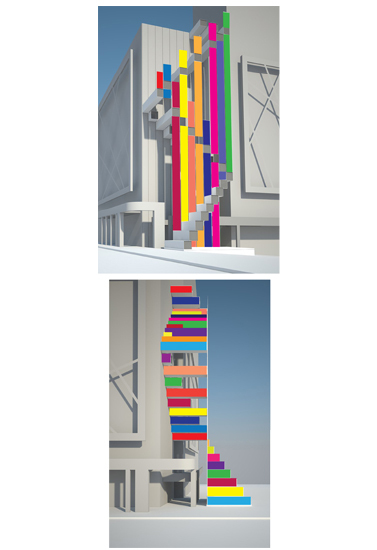 The 9 'oversized stairs' represent the nine provinces of South Africa. The 20 squares/box beams that reach & touch the new facade represent the 20 years of freedom. The colours and paint work represent the life and diversity within our city and country. The structure highlights simple forms, generated from past outlines, that grow to form a new, simple yet complex almost digital image as an icon for the future. 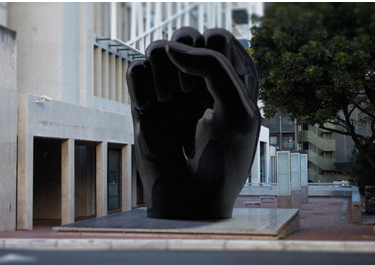 The public art sculpture aims to capture the spirit of freedom and the act of democracy. A 100m long winding ‘tail’ extends from the rings, continues down into the public square to form an amphitheatre and public seating. The ‘tail’ refers to the long queue of voters during the democratic election which is now serving as a public seating for the people. 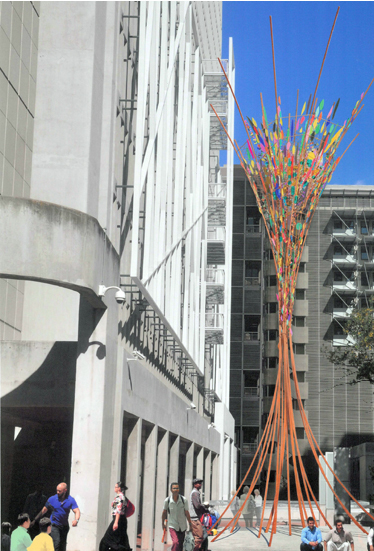 The sculpture will ight up at night and become part of Long street. With the design of the Surgery Unit Ward, the designers created a soothing and comfortable healing environment, providing a workplace that allows the staff to optimise patient care. The AgriSuite Online® system is an internet and mobile phone information application that was specifically designed to address the food security crisis facing South Africa and the Southern African Development Community (SADC) region. The Better Living Challenge wants to address the growing housing backlog by finding alternative, affordable and sustainable low-income housing solutions. The ultimate aim of the Berg River Project is to restore the most important river system in the Cape Town Metropolis to a healthy river system that will promote human wellbeing.